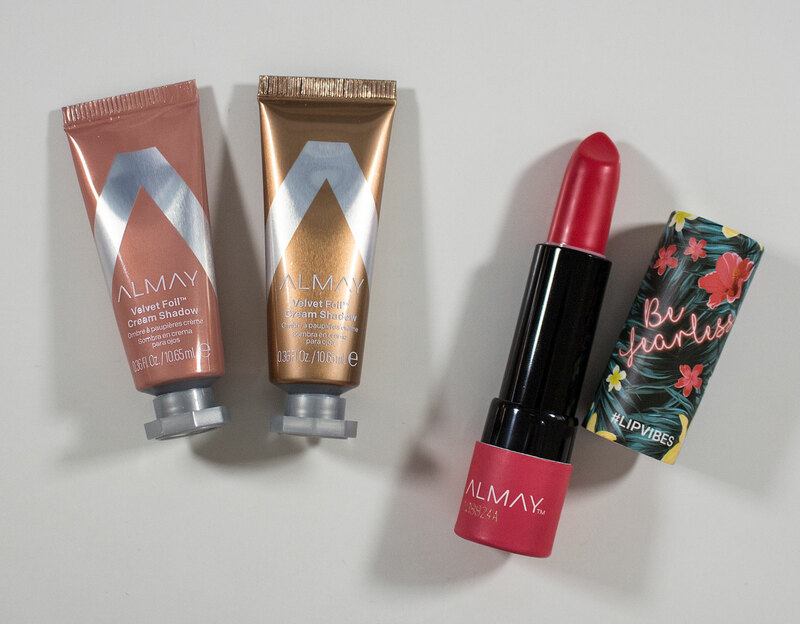 Almay Velvet Foil Cream Shadow in Golden Vibes and Cupid Glaze & Lip Vibes in Be Fearless. These Almay Velvet Foil Cream Shadow retail for $7.99US and $10.99CAN for 0.36 fl oz / 10.65 ml of product. And the Almay Lip Vibes for $7.99US and $10.99CAN for 4g / 0.14 oz of product. 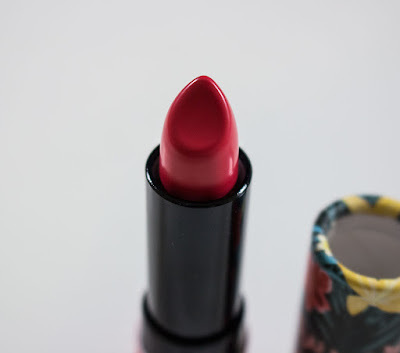 Almay Lip Vibes in Be Fearless close up of the lipstick bullet. 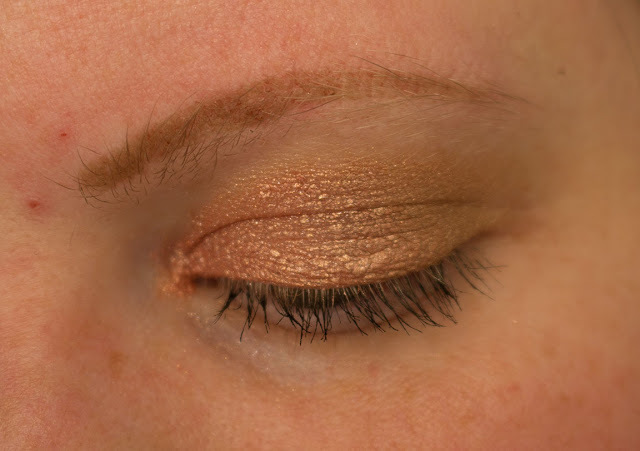 Almay Velvet Foil Cream Shadow in Golden Vibes and Cupid Glaze. Almay Velvet Foil Cream Shadow:Isododecane, Mica, Trimethylsiloxysilicate, Methyl Methacrylate Crosspolymer, Calcium Aluminum Borosilicate, Dimethicone, Tribehenin, Isohexadecane, Sorbitan Trioleate, Nylon-12, Talc, Disteardimonium Hectorite, Candelilla Cera/Euphorbia Cerifera (Candelilla), Wax/Cire De Candelilla, Phenoxyethanol, Silica silylate, Propylene Carbonate, Sorbic Acid, C12-15, Alkyl Benzoate, Silica, BHT, Camellia Sinensis Leaf Extract, Aloe Barbadensis Leaf Extract, Cucumis Sativus (Cucumber) Fruit Extract, Tetrasodium EDTA, Tocopheryl Acetate, Methylparaben, Propylparaben. May Contain: Aluminum Powder (CI 77000),Bismuth Oxychloride (CI 77163), Carmine (CI 75470)/ Cochineal, Ferric Ammonium Ferrocyanide (CI 77510), Ferric Ferrocyanide (CI 77510),Iron Oxides (CI 77491, CI 77492, CI 77499), Titanium Dioxide (CI 77891). Almay Lip Vibes:Isononyl Isononanoate, Ozokerite, Octyldodecyl Neopentanoate, Diisostearyl Malate, Mica, Bis-Diglyceryl Polyacyladipate-2, Silica, Cetyl PEG/PPG-10/1 Dimethicone, Hexyl Laurate, Polyglyceryl-4 Isostearate, C10-30 Cholesterol/Lanosterol Esters, Polyethylene, Nylon-12, Paraffin, Synthetic Wax, Synthetic Fluorphlogopite, Butyrospermum Parkii (Shea) Butter, Portulaca Pilosa Extract, Sodium Hyaluronate, Tetrahexyldecyl Ascorbate, Tocopheryl Acetate, Palmitoyl Tripeptide-38, Cetearyl Ethylhexanoate, Ethylhexyl Palmitate, Hexylene Glycol, Silica Dimethyl Silylate, Sorbitan Isostearate, Sucrose Cocoate, Butylene Glycol, Flavor, Benzoic Acid, BHT. May Contain: Bismuth Oxychloride (CI 77163), Blue 1 Lake (CI 42090), Iron Oxides (CI 77491, 77499), Red 6 Lake (CI 15850), Red 7 Lake (CI 15850), Red 28 Lake (CI 45410), Red 33 Lake (CI 17200), Titanium Dioxide (CI 77891), Yellow 5 Lake (CI 19140), Yellow 6 Lake (CI 15985). 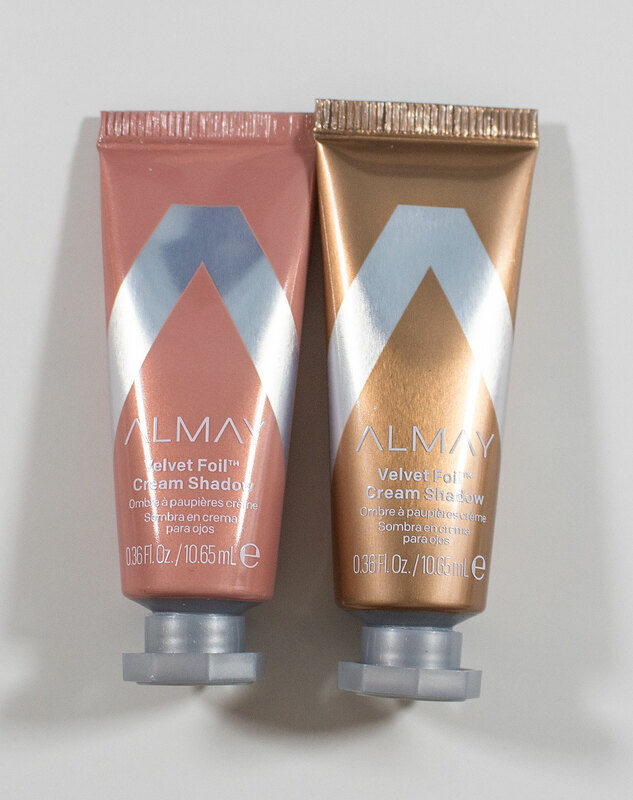 The Almay Velvet Foil Cream Shadow in Golden Vibes and Cupid Glaze are a cream eyeshadow formula. 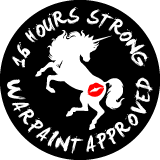 it a has a soft texture that dried down and sets after 10 minutes, you do have some wiggle room when you apply these. These shades work best with a finger but they can be applied with a brush. These shade can also cake up if you apply too much product on the eyes as the formula is buildable I was trying to apply more to the inner corner around the tear duct and it does look thick and crackly these when I did do my first wear test with these. An interesting thing about the formula is certain shades have Calcium Aluminum Borosilicate in them but most of the shades actually doesn't have this nice white glitter ingredient. I found the that the shade Cupid Glaze which does have it the glitter faded over the course of the day faster than the base colour and the shimmer in the base colour still look the same. 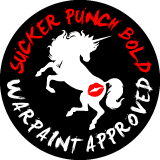 This is not to be unexpected without using s primer of glitter glue was it is a larger particle compared to traditional pigments. 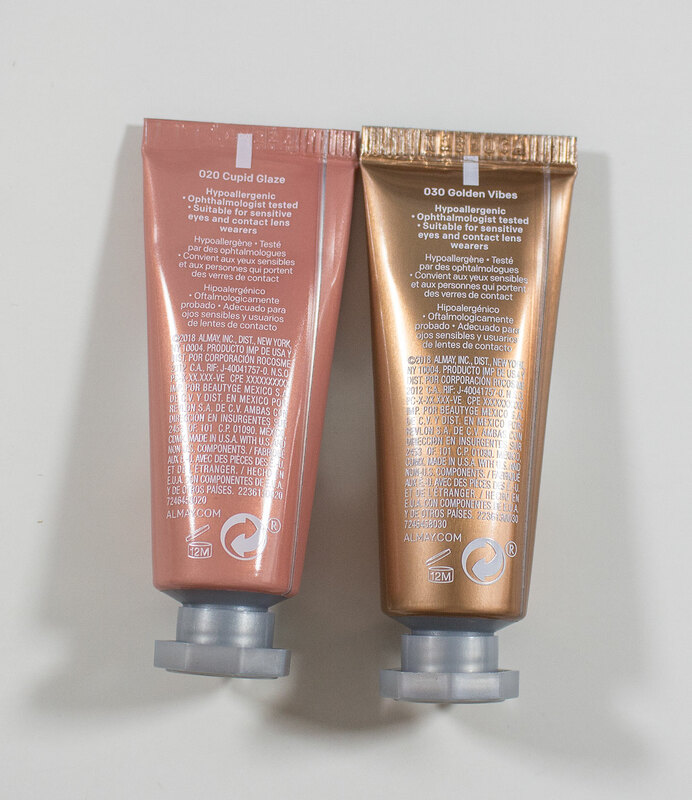 Golden Vibes is a warm aged gold with a shimmer finish. Cupid Glaze is a warm peach shimmer with a white micro glitter finish. Almay Lip Vibes in Be Fearless is a bright coral red with a satin finish. 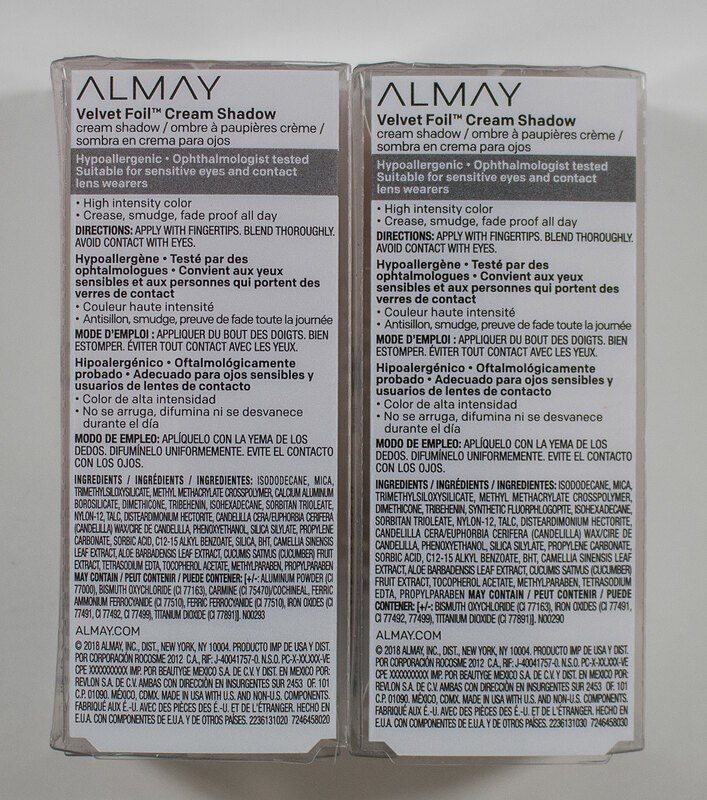 Wear: The Almay Velvet Foil Cream Shadow wear for 12 hours before I notice any fading and was still going into the 16th hour for me. I did find my wear time speed up in terms of fading during one test when I rudding my one eye through the day those. ;) so don't do that. 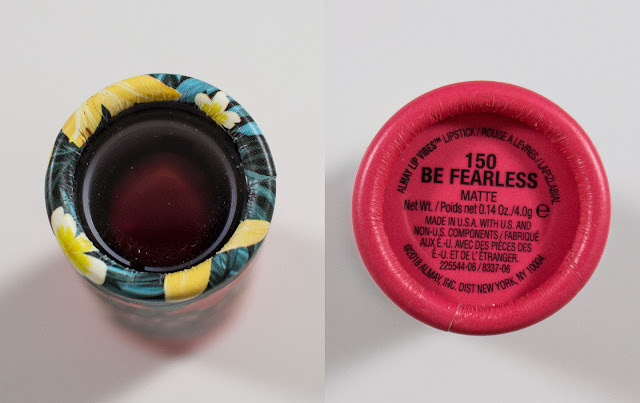 The Alamy Lip Vibes in Be Fearless I get about 5-6 hours to wear before fading occurs. 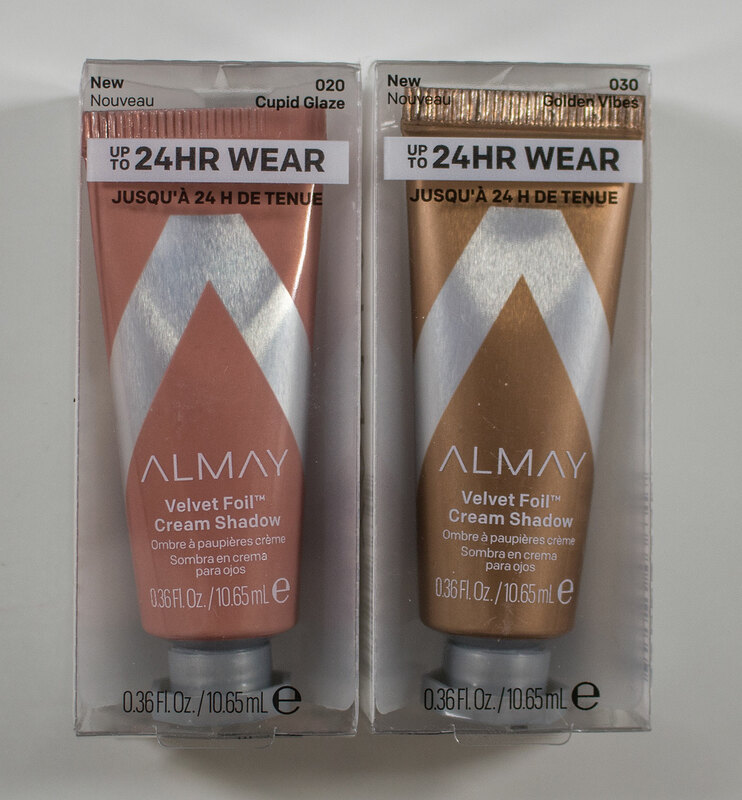 The Almay Velvet Foil Cream Shadow is a plastic tube with a plastic cap that keeps the product from drying out while the tube stays flexible. The Almay Lip Vibes bullet style lipstick packaging is a paper stock tube that doesn't feel cheap or thin at all and rather sturdy, with a clear window lid and inside plastic components. 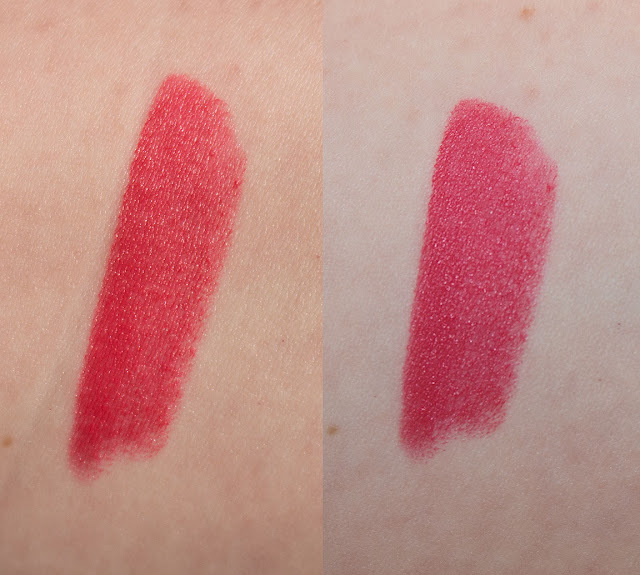 Daylight & Flash swatch: Almay Lip Vibes in Be Fearless. 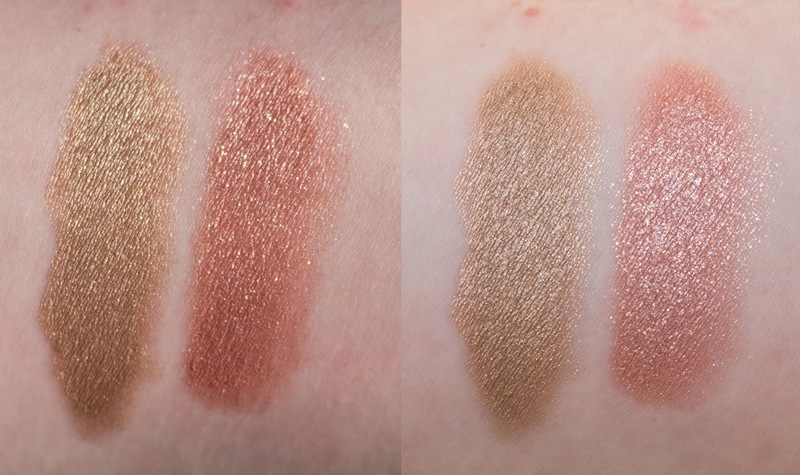 Daylight & Flash swatch: Almay Velvet Foil Cream Shadow in Golden Vibes and Cupid Glaze. Almay Velvet Foil Cream Shadow in Golden Vibes outer edge of eyes and Cupid Glaz on inner corners. 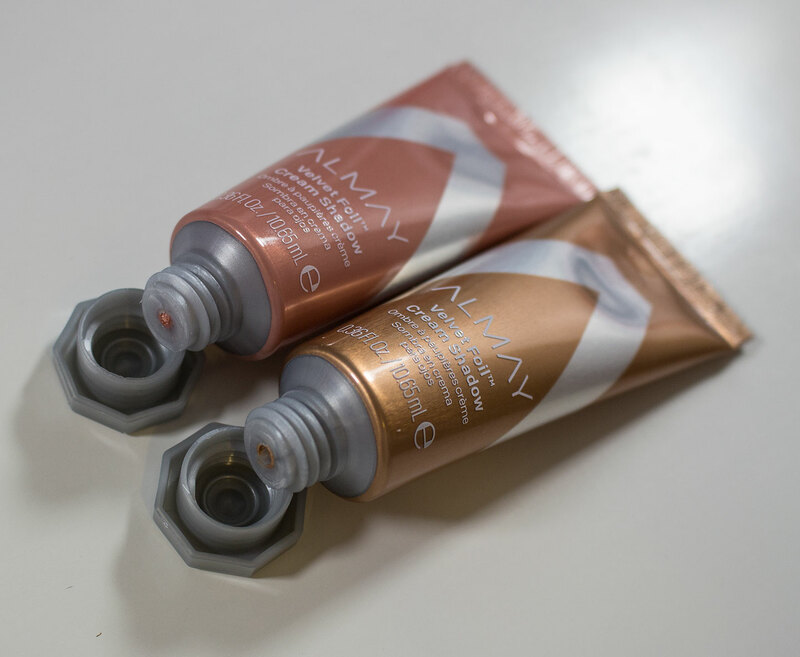 I know this collection came out in the US back in October so it's super delayed release here in Canada but I'm rather impressed with Almay to reach outside their branding comfort so zone to promote newer product formulas. 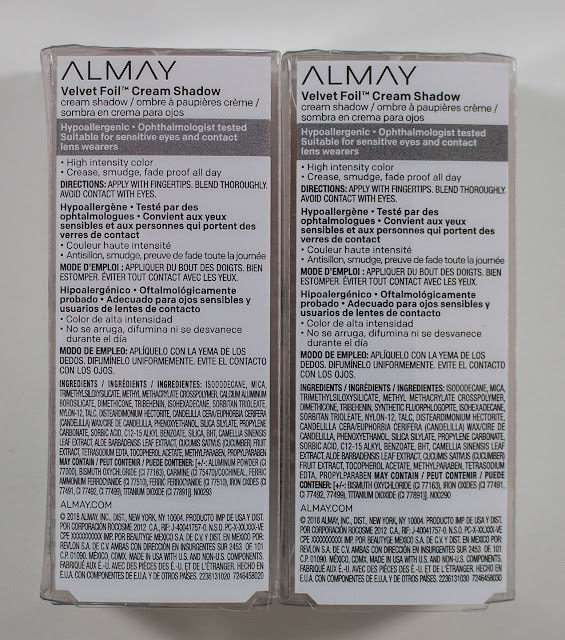 The Almay Velvet Foil Cream Shadow although initially reminded me of a MAC Paint, formula wise i feel more like K-Beauty cream eyeshadow. I'm also glad it preforms so well given these are some of the more problematic shades in the range from my research. 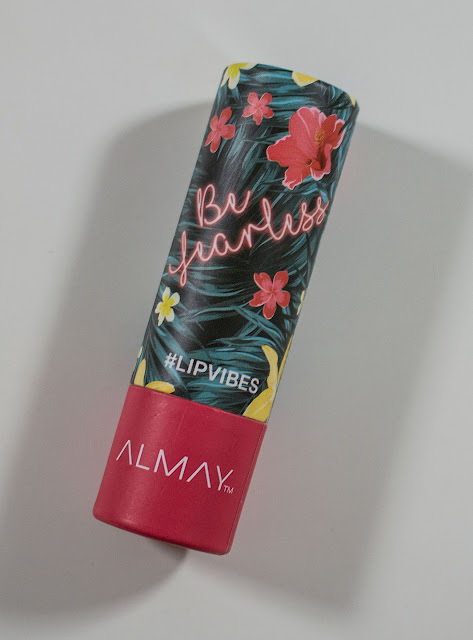 Almay Lip Vibes in Be Fearless matte lipstick formula is a rather nice addition to the market but it's not overwhelming exciting to me as it's more a satin cream formula.